This post is the second in an occasional series. This site already contains a large number of documents produced by Big Flame or its members. Most can be found in the 30 posts in Episodes in Big Flame History. Each post contains links to documents which relate to its theme. Links to the same documents are also listed on the website’s Publications page, this time sorted by type – pamphlets, journals, newspaper, internal documents. The second document I want to discuss is: Labouring Under the Tories? This short pamphlet was written in the summer of 1979. I’m not sure of the exact date, but it is first mentioned in the September issue of the Big Flame newspaper. Thus it was produced only a few months after the Tories General Election victory in May of that year. Given the publication date, it is surprising that the analysis of Thatcherism is not especially prescient (what became known as Thatcherism only emerged over a period of time). This is not to argue that the Tory polices described weren’t important features of Thatcherism – structural long-term unemployment, removal of trade union rights, cuts in public expenditure, the strong state, etc. Like rest of left Big Flame not appreciate immediately how fundamental a change had occurred. The pamphlet did acknowledge that election victory signified that the Tories had won working class support for their “vision of an individualistic, competitive society”. However, the new government is mainly seen as “consolidating” the previous Labour government’s adoption of similar polices at the behest of the IMF. The pamphlet is less about the Tories, than the Labour Party and need to develop a socialist alternative. The problem is how to break out of the cycle of militancy, followed by reformist politics and back again. The key message is to avoid the mistake made under the previous Tory spell in government 1970-74, and for those struggling against the government to limit themselves to calls for the return of a Labour government, and to rely on Labour and the trade union left to lead the struggles. In this respect the position laid out in the pamphlet is very similar to the 1971 broadsheet featured in the previous post in this series: How To Fight Them (link to https://bigflameuk.wordpress.com/2010/03/24/how-to-fight-them/). The key task is to develop wider perspectives which link defensive struggles to a challenge to capitalist ideas and control. I can’t recall much disagreement in Big Flame about the pamphlet. However, there were clearly some members who weren’t happy with the contents. One referred to it a few years later (1983) as “that terrible pamphlet” and dismissed “the battle of ideas, ideologies, alternative plans and similar wishful thinking” by counter posing them to “solid working class organising”. This suspicion of the pamphlet may in part be due to the fact that by then some main of the authors had departed BF for the Labour Party. Myself I can’t see that pamphlet says much which leads on to that decision. Entryism in the Labour Party is rejected as based on a “fundamental misconception about the relationship of the Labour Party and reformism, and to the working class”. It also argues that “slogans and demands” will not prove to people that socialism is the answer, and that alternative plans are not ”the solution” and can’t be “a substitute” for more familiar forms of struggle. If I have a criticism of the pamphlet it is that it is very limited in developing the wider perspectives it said were needed. I don’t disagree with any of the things it supports: alternative plans, rank and file organisation, solutions based on the needs of all oppressed classes and groups, material internationalism, a strategy based on the active participation of the working class, and making the struggle for socialism “meaningful, worthwhile and enjoyable”. The problem is that it fails to go beyond this level of generality. However, to expect much more is probably unrealistic from something brought out very quickly to promote a position as soon as possible after the election. Further, everyone else on the left, at the time and since, equally failed to develop much in the way of perspectives which would make socialism meaningful and popular. If the coming election works out as predicted in the opinion polls, socialists will face a situation in some ways similar to that of 1970 and 1979. However, there is little need to warn anyone about the need to avoid having illusions in the Labour Party. Click here to read: Labouring Under the Tories?. A number of episodes in this series have focussed on the key debates at Big Flame conferences between 1975 and 1980 (see Episode 5, Episode 11 and Episode 22). 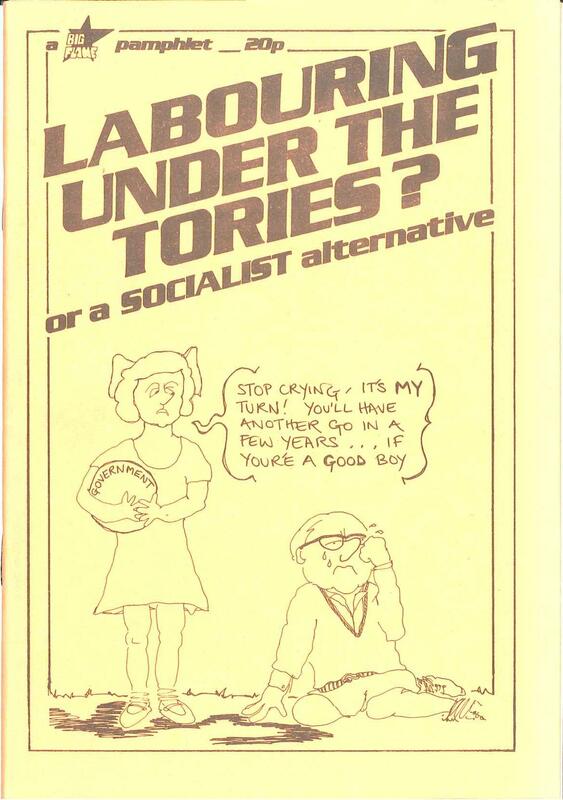 The main December 1981 Conference debate was about joining the Labour Party. Today Labour Party membership isn’t seen as a credible option by most of the left. Back in 1981 the situation was different. The Labour left seemed to be gaining ground, with Tony Benn narrowly losing a battle for the Deputy Leadership of party. Many others had recently joined the Labour Party. Not just various Trotskyist groups pursuing an entryist tactic, but substantial numbers of the independent left including many ex-members of the IMG (International Marxist Group) and IS/SWP (International Socialists/Socialist Workers Party). This trend across the left struck no chord amongst the Big Flame membership before 1981. There was little dissent from the view was that revolutionaries should take no interest in attempts to transform the Labour Party, and placing any hopes in the Labour left could only lead to disillusionment. Only a few years before Big Flame had been unable to agree a position on whether or not to call for a Labour vote. Back in 1974 Merseyside BF had supported voting Labour on the grounds it was the weaker enemy. By May 1978 BF was a national organisation, and its Conference took place with a General Election expected soon. A vote Labour “but build the class struggle against Labour policies” position was lost 43-44. A “there are no tactical advantages” in voting Labour position also lost 37-45. The issue went to a ballot of the BF membership later on in the year. This agreed that unless revolutionaries were standing the organisation’s perspective should be “the working class will have to fight any government” and “vote Labour to keep the Tories out”. This article in the Discussion Bulletin of April 1981 brought together all the previous positions adopted by Big Flame in relation to the Labour Party. Not just the issue of voting Labour, but also reformism in general, past Labour governments, the Labour left, the Alternative Economic Strategy (AES) and campaigns to democratise the Labour Party: Big Flame and the Labour Party. During 1981 four distinct currents emerged in Big Flame. Two became formal tendencies and adopted a name: “Facing the Challenge” and “Emerald Street”. Two didn’t, so I have had to choose names for them: the “Group of Nine” (a phrase used by one of its better known members in a private letter) and the “North London four” (they were a minority of this local group). This is how the different positions evolved. First, there was a split in Tendency One (the latest incarnation of the current in BF which sought to revise its traditional politics. For a discussion of this tendency see Episode 22 of this series). Differences emerged in the run up to the December 1980 Conference. Amendments to the Tendency’s motion which would have made the criticism of the AES much stronger were rejected. Thereafter the Tendency ceased to function as a group. The majority, who I will call the “Group of Nine”, moved towards a position of support for Labour Party membership. This position was first set out in a document for a Day School on the Labour Party in June 1981 which was included in the May 1981 Discussion Bulletin. Second, a BF member dissatisfied with the 1980 Conference drafted a document on the 24th December 1980 entitled “Facing the Challenge of the ‘80s” to begin the process of thinking ahead to the next Conference. He wanted the organisation to focus on rebuilding working class power and to discuss restarting base groups. In the course of 1981 a tendency was formed based on a restatement of “working class autonomy” and “mass politics” in the changed conditions of the 1980s. Documents were published in various Discussion Bulletins throughout 1981. The name of the first (and subsequent) documents was adopted as the name of the tendency. This tendency constituted a re-emergence in BF debates of the current which aimed to defend traditional BF politics, and was thus a successor to “Plan X” at the 1976 Conference (see Episode 11). Third, in response to the positions being argued by the “Group of Nine” the “North London four”, who had previously presented a perspectives document to the 1980 Conference as part of a larger “North London group” (also see Episode 22), started to develop their own approach to the Labour Party as well as more general issues, starting with a document for the June 1981 day school (reprinted in the July Discussion Bulletin). Finally, after an initial discussion at the Summer School in August 1981, another tendency was established at a meeting the next month (taking the name of the venue of this meeting – “Emerald Street”). In the words of the invitation the tendency wanted to adopt “a middle way between accommodating to left reformism and ultra leftism”. It included both members of the former Tendency One, and others who had not been part of it. The first position statements from this tendency appeared just before the conference in the November Discussion Bulletin (although individual supporters had made previous contributions to the debate). I now want to examine each of the four positions in more detail. 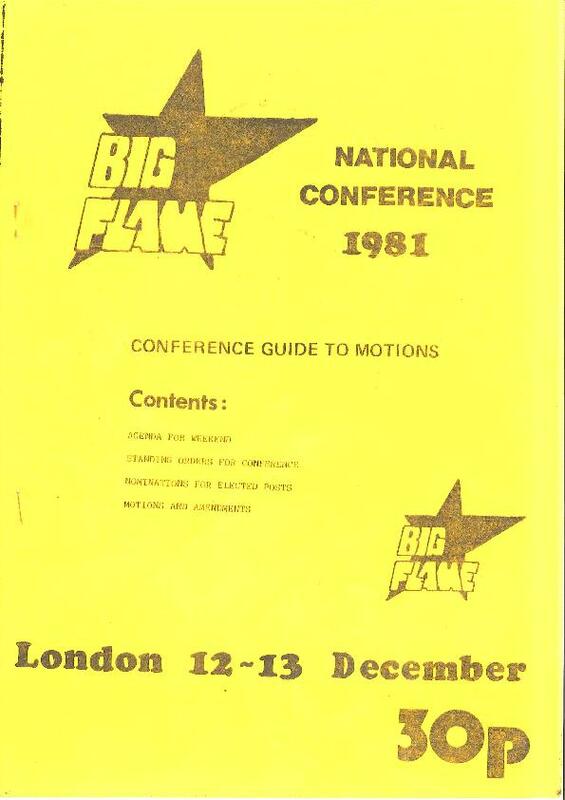 As mentioned above, the first document from members of the “Group of Nine” was included in the May 1981 Discussion Bulletin: Big Flame and the Labour Party: A New Political Direction? The authors argued that the key question was not Labour Party (LP), but a long term political direction. BF would be unable to make its politics effective unless it merged into a larger force. The LP had become an attractive option for increasing numbers of people, and was now the place to find the largest number of people who shared BF’s conception of politics. It was the place to build a new revolutionary socialist tendency “at the present time”, which was distinguished from arguing for permanent work in the LP, or against independent revolutionary organisation. Another document by “Group of Nine” supporter argued that they have no illusions about the labour Party, which “is not, and never will be the agent of socialist transformation in this country”. Additionally, “it is not a matter of some of us asking to be ‘allowed’ to join the LP. It is a matter of the whole organisation, LP members or not, relating keenly to that work, supporting it” (October 1981 Discussion Bulletin). In one more document the authors argue that there is a prospect, at least in some parts of the country, of “considerable recruitment” to BF within the LP. A best outside the LP BF might double in size to 300. Even with 600 members, it would still be “a pimple” (October 1981 Discussion Bulletin). No figures are given for (the presumably much larger) forces which might be brought together inside the LP. Aside from general references to a “transitional strategy of reforms” to put socialism on the agenda, none of the documents say much about what people would do once inside the LP. The two documents produced by this grouping were: For a New Relationship with the Labour Party (July 1981 Discussion Bulletin) and A Perspective for Big Flame in the 80’s (September 1981 Discussion Bulletin). The “North London four” argued that joining or not joining the Labour Party was the wrong starting point and subsidiary element of an overall strategy. They criticised the “Group of Nine” for being too soft on the AES, and overestimating the likely level of support for BF politics within the LP (disputing the suggestion of the potential for forming something larger than the Project or Socialist Unity). Their starting point was the recession and the way it was being used to restructure the working class (Andrew Friend and Andy Metcalf’s book Slump City was a key influence). BF should focus of activities which created bridges and healed divisions across the working class. LP activity was one of a number of forums where this might be attempted. The decision to join the LP or not was a tactical question at any particular time. The first document talked about how a left reformist government might open up political space outside it. The second criticises it for placing too much emphasis on something that might not happen. Its focus is on the immediate future in Constituency parties and Labour Councils. Whether or not LP membership would be of value would depend on the local situation. The authors stressed the dangers of LP membership – making adaptions, too much time devoted to internal struggles, etc. They expected that only a minority of BF might join the LP but, similar to the “Group of Nine”, it was important that a “substantial majority” of BF believed that those who did were making “a valid contribution to the class struggle”. There was an article by the initiator of “Facing the Challenge of the ‘80s” tendency in the May 1981 Discussion Bulletin. He started from the position that the 1980s were very different from the late 1960s (when a lot of the ideas which influence BF originated). What was needed was a “radical rethink of the working class autonomy tendency”. This would create a “more politically decisive BF” which would be “a rich meeting place for mass organisers”. The final, and clearest, statement of the perspective of this tendency was in Facing the Challenge of the 80s (October 1981 Discussion Bulletin). The authors argued that BF needed to rebuild “in a modest fashion” mass work both theoretically and in practice. It should get closer to “our tendency” (as with Plan X in 1976, groups were listed as containing people who shared BF’s politics. This time the Conference of Socialist Economists, community and trade union resource centres). The fault for the lack of influence of this politics can be “laid at the door of BF”. Thus, mass politics has been “virtually chucked away”, the organisation’s distinctiveness has been lost by “neglecting our theoretical heritage”, “we haven’t sufficiently aided the building of a mass independent working class organisation” by having “having an unclear idea of what the role of BF is”. None of the “Facing the Challenge” documents had much to say about what rethinking the “politics of working class autonomy” for the 1980s actually meant. The Conference motion from the tendency called for a six month period of “major debate” after which BF would decide on “a clear strategy” which would then be publicised in a series of events and conferences. There is room to work with LP members on particular issues but the position of “having any members in the Labour Party” was rejected. The two documents produced by this tendency were: Discussion Document on Big Flame’s Perspectives and Notes about Reformism (both in the November 1981 Discussion Bulletin). The authors argue that over the previous 2½ years the Tories had decisively affected the dynamics of class struggle, whilst the LP had moved away from non-class modernising highly technocratic politics to an earlier traditional rhetoric of socialism. In turn much of the left had adapted to left reformism. Criticism was directed not at reforms in themselves, but reformism which always disorientated and demoralises the working class. Because of this understanding of reformism, the relationship of the LP to the state and the weakness of revolutionaries relative to left reformism, LP membership as a strategy for BF was rejected. At the same time “Emerald Street” believed that the wishes of “Facing the Challenge” to launch a new project was “wildly over-optimistic”. The alternative strategy can be summed up (and these are my words, not theirs) as consolidation for long term survival. It was “vital to strengthen BF” by such measures as more rigorous application of membership norms, more attention to political education, and a better expression of BF politics in the paper and other publications. Immediately prior to the Conference the “Group of Nine” and the “North London four” dropped their separate motions and produced a combined motion: Motion 3 – Big Flame’s Strategy (defeated). The composite owes more to the latter’s position than the former, with LP membership occupying only one page of six (with objectives spelt out and problems acknowledged). Nevertheless, the “North London four” were aware that the new motion disguised significant differences. They agreed to a composite through their feelings of isolation because of the lack of support for their position in BF. A transferable vote system was used to ensure a clear outcome. The initial result of the vote was: Emerald Street 42%, Combined LP position 29% and Facing the Challenge 27%. With votes transferred, this became: Emerald Street 53% and Combined LP position 29%. Finally on a straight yes/no vote for the Emerald Street position the figures were 65% yes and 19% no. Following the conference some (but not all) of those who voted for the combined position on the Labour Party left Big Flame. My estimate is that no more than about 20% of the organisation’s 125 members left. The Conference alliance between the two pro-Labour Party membership groupings came to end, as those who left BF decided not to form a new grouping and went their separate ways. The original “North London four” position can be seen as an attempt to keep BF together. As were a set of amendments from another BF member to their withdrawn motion – after the compositing these were themselves withdrawn. Their net result of the amendments would have been to allow some members to go off and do their thing in relation to the Labour Party, whilst distancing the organisation from it. However, the differences were too great for this sort of compromise. As an Emerald Street supporter argued a “half in half out” position would probably have structurally reinforced the divisions in the organisation and created serious problems for the paper and other public pronouncements (Discussion Bulletin May 1981). The “Group of Nine” and “Facing the Challenge” were in complete agreement that BF was drifting and lacked a sense of direction. That it could no longer be “all things to all people” or “muddle on and hope for the best”. Both were extremely hostile to each others position (This refers to what was said in the written documents. The debate at the conference was conducted in a comradely manner). Probably the only solution was to go off along separate paths. Note: Titles of articles or documents in red and bold are links to the full version. Press on them to bring up a PDF of the document.